Morris Plains, NJ ~ The Talk of The Town: Financing Your Morris Plains Home... What Type of Loan Structure is Best for YOU? Financing Your Morris Plains Home... What Type of Loan Structure is Best for YOU? When buying a home, financing is always the first factor in pre-qualifying you to buy your home! If any step in buying a home is confusing, complex, or tedious, it's figuring out how to get the right kind of financing. However, since the Internet has made it relatively easy to learn about, shop for, and secure great mortgages and companies, the frustration factor of getting financing has been mercifully reduced. If you decide to work with a referral from someone, that also eases the process and if they came recommended, you know that 'your friend' had a good experience and was taken care of too. There are many different types of loans available. However, one of the basic decisions you'll have to make is whether you prefer the predictability of a conventional loan, knowing that your payment will be the same amount each month over the life of the loan, or whether you are comfortable with foregoing the fixed monthly payment for an adjustable loan where the initial interest rate is lower and the monthly payment amount will fluctuate periodically throughout the life of the loan ~ such adjustables are fixed for usually 5yrs. Both the conventional and adjustable loans provide a variety of terms to select from that will best meet all your needs. A mortgage broker will be able to provide you with a wealth of information on the various options available as well as determine whether you qualify for any government-backed loan programs. How much house can you afford? The rule of thumb is that you can buy a house that runs about two-and-one-half times your annual salary. But you'll do better to use one of many calculators available online to get a better handle on how your income, debts, and expenses affect what you can afford. 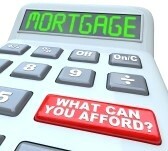 Determining how much home you can afford means figuring out what size mortgage a lender will qualify you for. With rates still at an ultimate low... 4% (30yr fixed) the guidelines might be a tad more strict but anything under 5% with house prices as low as they are... is the best time to buy and get the financing you can afford. Happy Home-Buying, LouAnn will make it a fun & memorable process!